Outside of my apartment building at 10:30 am on a Friday. Note the other people, completely un-phased. When I first told people I was moving to Korea, one of the first inquiries was how safe I was going to be, you know, since I was going to be so close to North Korea. Sigh. While I’m no expert and I am never as informed as I’d like to be on world news, I can tell you right now that North Korea’s probably not making any serious waves anytime soon. I don’t meant to oversimplify or reduce in any way the travesty of human rights aggrievances taking place there, I just want to point out that North Korea has had literally no bearing on my experience living in SOUTH Korea. In fact, from what I can tell, SK seems to be one of the damned near safest places on this planet. Petty crime is virtually non-existent here. I’m telling you, the Korean police must just eat doughnuts and let the abundance of American soldiers stationed here do the dirty work for them because their presence is basically neither seen nor heard, Buster Bluth style. Rumor has it that someone who worked at my school once lost their passport at a busy department store. Sidenote—every store/every place/everywhere in Seoul is always, ALWAYS busy. Hours later, her passport was untouched and unmoved. One time I was hiking with Kenny and he decided to leave his nice leather coat at the base of the mountain cause it was so nice and warm out. He tossed it on the ground to the side of the path thinking, this is Korea, no one will steal it. On the way down the mountain, not only was his jacket not stolen, someone had picked it out of the dirt for him and HUNG IT UP ON THE FENCE. Ridiculous. One of the perplexing contradictions of Korea is that for such a conservative culture, people of all ages, shapes and sizes regularly get belligerently hammered and pass out in public and NO ONE MESSES WITH THEM AT ALL. It is as if because there are no open container laws, Koreans get a free pass to sleep in public, too. A+B=C type stuff. I will say that this combined with better public transit probably leads to a much lower frequency of drunk driving here although I can’t be certain. 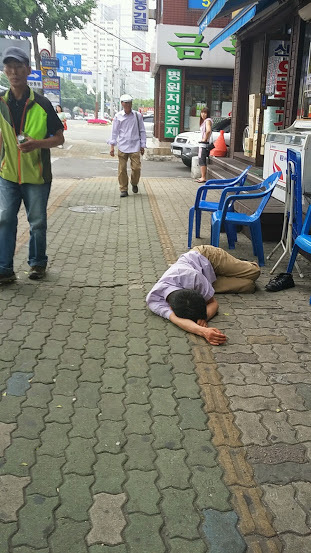 In fact, there is an entire website dedicated to the documentation of drunk passed out Koreans and it is HYSTERICAL. If you think it won’t be that funny, just trust me that I have witnessed scenarios identical to those featured and picture me bursting into explosive cackle-tear-producing laughs in real life and I’m sure you it will be worth your time. Just check out this gem of a website, Black Out Korea, for a real kick, good for so many laughs, so accurate and too accurate.